Home » Health » Symptoms of Magnesium Deficiency and Why Magnesium is Important to Your Health ! 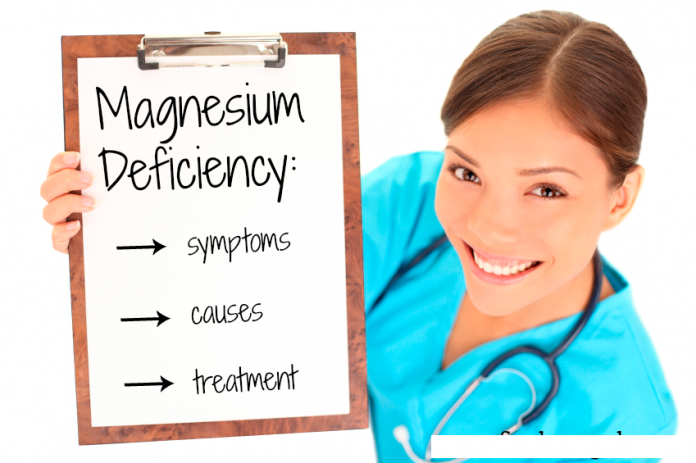 Symptoms of Magnesium Deficiency and Why Magnesium is Important to Your Health ! Magnesium. You probably have heard about it and may know a little bit about it, but do you know how beneficial it is to your health? Magnesium is important to nearly every organ, tissue and function in your body. From basic cellular health to heart health, magnesium is vital to your health. A low magnesium level can weaken your immune system and plays a critical role in various acute and chronic diseases. However, most people do not know what a proper magnesium level is. A recent statistic shows that most Americans, nearly 80 percent according to Dr. Mercola, are magnesium deficient. Fortunately, magnesium is easy to incorporate into your diet. There are various different food sources—grains, fruits, dark-green leafy vegetables, nuts, fish, avocadoes, bananas, and even dark chocolate—to eat in order to get more magnesium into your diet. The problem is these foods are not in your typical American diet. Most Americans consume processed foods, which lacks any substantial amount of magnesium. Magnesium is the trigger that activates more than 300 enzymes. Enzymes regulate many body functions, including energy production and muscle contractions. Magnesium works as a signal for muscles to contract and relax. And when the muscles that line major blood vessels contract, it impacts your blood pressure. Magnesium helps just about every other chemical in your body do its job. Magnesium is mainly an intracellular (inside the cells) ion. Most magnesium in the body is in the skeleton, 20 to 30 percent is in muscle, and only about 2 percent is outside of cells. This leaves you with looking for signs and symptoms of deficiency. Below are 9 early warning signs that you are magnesium deficient. Like with most other nutrient or vitamin deficiencies, starting with your diet is best. As mentioned above there are several different food/food categories that are rich in magnesium. Among foods relatively rich in magnesium are dark leafy greens (spinach and kale), nuts and seeds (squash and pumpkin seeds), fish (specifically mackerel), beans and lentils (soybeans, kidney beans, chickpeas), whole grains (brown rice, quinoa), avocados, low-fat dairy (plain non-fat yogurt, goat cheese), bananas, dried fruits (prunes, apricots, dates), and dark chocolate. Creating a balanced diet with some of the above mentioned foods will help increase the amount of magnesium you get in your diet. If you are unable to increase your magnesium levels enough with diet alone, there are supplements you can use to bridge the gap. You do not want to overwork or shock your body by immediately spiking your magnesium levels with supplement. So, it is best to slowly incorporate and gradually increase the amount of magnesium you intake via supplements. It is recommended to increase to about 300-400 milligrams per day (you can safely take up to 600 milligrams a day). Also, if you are experiencing added trips to the bathroom, do not be too alarmed. Magnesium does act as a laxative, which is another reason to gradually increase your supplement dosage. Something that is so intertwined into your health should not remain unchecked and deficient. Whether it is through diet or a supplement, maintaining a proper magnesium level is vital to your body’s health.